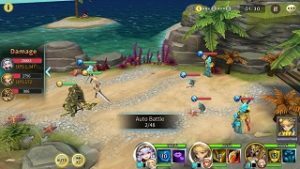 Soul Seeker: Six Knights is the latest RPG for mobile by Clegames. In the game, you will strategically build & pair the units for the highly action-packed battles. The battle system is not fully auto; you can manually move the characters, use skills, and summon partners. Soul Seeker: Six Knights features over 100 unique heroes, PvP battles, dungeon modes, tower mode, and many more. The game tasks you to build a strong team of the best heroes to dispatch the enemies to hell. If you are having the trouble understanding the game’s mechanics or looking for tips, cheats & stratgey, then our Soul Seeker: Six Knights guide and Soul Seeker: Six Knights tips, cheats & strategy will help you. Things To Know In Soul Seeker: Six Knights Game! You can go with up to seven heroes for the battle; three main heroes, three sub-heroes, and one borrowed hero. But in the battle, only three heroes will fight. If you select the heroes in sub-slots, you will be able to replace the main heroes when the switch gauge is full. So it would be better to assign the partners in sub-slots for the benefit. Abandoned Fortress – In this mode, the player fight against the waves of enemies for the gear items. Tower Of Heroes – In this mode, you will face elite monsters on each floor. This game mode is not quite easy, but the rewards are precious. Especially for gold farming, this game is good. Apart from above-mentioned game modes, Soul Seeker: Six Knights also features two more game modes; adventure(the beginner’s entrance) and synergy dungeon. You can enter the synergy dungeon mode stages if you have all the heroes of a synergy group. You can check the partners of the heroes in Synergy Illustration. Tap the hero button -> Synergy Illustration. All the heroes in Soul Seeker: Six Knights belong to one of the following five elements; fire(Red), water(water), wind(green), light(yellow), and darkness(purple). And, all the heroes have different abilities/skills, stats, roles. For example – guardian type heroes are good tanks(high HP stats – defenders), priest type characters have healing abilities(healers), warrior/bandit/archer/wizard type heroes are good attackers. To check the hero’s type, go to the hero menu -> hero illustration. Apart from above-mentioned heroes, there are some material heroes too. For example – Skill Beanny, Star Beanny. You use these heroes to develop main heroes. All these heroes come in grades(low to high) -> Rare, SR, SSR. How To Get Heroes In Soul Seeker: Six Knights? You can obtain heroes via summoning; using the diamonds, summon ticket, friendship points. And, by exchanging the elemental soul stones. Via Summoning -> Go to the summon menu -> there you can spend diamonds and obtain the hero. The drop rates are; Rare(81.5), SR(15), SSR(3%), and Skill Beanny(0.5). Additionally, if you have summon tickets, you can use them. Usually, you get these tickets as a mission reward. Friendship Points -> You can summon a hero by spending 500 friendship points. To earn friendship points, add friends in the game. And, in the team, add their main hero. In a similar way, you can obtain a high-grade weapon, armor, rune for the character. Elemental Stones -> You get these stones by playing the temple armes mode. Use these stones to summon the desired hero. 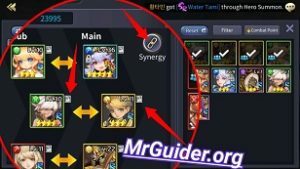 How To Increase The Power Of Heroes In Soul Seeker: Six Knights Game? There are two ways to level up heroes in Soul Seeker: Six Knights; use the EXP item or include that hero in the team and play the game modes; winning the matches reward XP to the heroes in the team. EXP Item – You can obtain food material or EXP item by completing the quests, from temple mode, adventure mode, events. Use this item to level up heroes fast. To use it, go to the hero management menu -> tap the hero portrait -> level up -> use the food item; bread, meat, roasted duck, Pork BBQ, Omelette, Dinner. Once you reach the maximum level of a hero, you will be able to evolve him/her. For the evolving process, you can use star Beanny or other main heroes. Selected heroes will disappear. Go to the hero’s profile page -> evolve -> select the heroes(Beanny or main) -> confirm. It will cost you gold. Impact – Evolving will increase the star-level of that hero + stats +unlock skills. The star-level of a hero determines the number of unlocked skills. For example: If you have a 5-star hero, then he/she would have five unlocked skills. Whereas a four-star hero has four skills, a three-star hero has three skills, and so on. To upgrade the skill -> go to the skill tab in the hero profile menu -> tap the skill level up button -> select the material hero; you can either select the Skill Beanny or duplicate hero in this process. Gears come in different grades; common, premium, magic, rare, legend, and set. In Soul Seeker: Six Knights game, you get these gears by summoning, playing the adventure mode, abandoned fortress mode or craft(tap the side menu on the lobby screen -> forge). Make sure to equip the best gear to make the heroes strengthen. Hero -> select the hero -> equipment -> auto-equip. There are four types of runes featured in the game; attack runes, magic runes, defense runes, and special skill runes. You have to equip the right type of rune to a matching a hero. For example – Equip the defense rune to the defensive type hero(Guardians). Attack type rune to attackers. Magic type rune to wizards. All these runes come in three grades – low, mid(green), and high(blue). You can obtain runes by playing the dungeon of demons mode, as a reward, by summoning. Since gear’s quality and power stats impact the power of heroes, upgrading will directly boost the hero’s strength. To upgrade the gear -> go to the bag menu -> equipment -> tap the gear -> upgrade -> select the useless gears as the material. To upgrade the rune, head to the bag menu -> runes -> tap the rune -> upgrade -> it will cost you gold. Once you level up a gear or rune to its maximum level, you will be able to merge. Head to the inventory again -> tap the equipment or gear -> hit the merge button -> select the max level rune or gear -> confirm. Merging will improve the grade. From the adventure mode or other missions/events/mode, you can earn equipment material items such as iron, lumber, cloth, fragment, book page, and more. You can use these items to craft equipment items. Tap the side menu icon on the left side of the lobby screen -> choose to forge. Tap the side menu -> friends -> tap the heart icon next to a friend name. Synergy Dungeon is quite a different mode as compared to other modes. To play this mode, you must have a pair of Synergy heroes. If you have not, then you can play it. So try to collect as many heroes as you can to complete all the chapters in this mode. So this is the Soul Seeker: Six Knights guide for the beginners. Let’s have a look at our top Soul Seeker: Six Knights tips, cheats & strategy. Applying the synergy buff provides some special bonus to all or specific team members. All you need to do is add the two partners in the team. For example – Luna and Sion are partners. If you add Luna and Sion in the same slot; sub and main, all the allies will enjoy +5% STR(Strength) bonus. You can check the complete list of partners and buffs in the Synergy list(Hero menu -> Synergy Illustration). You don’t need to develop all the heroes or characters. To evaluate the hero; either he worths upgrading or not, go to its profile page and tap the evaluate button -> there you can check the review for that hero by other players. If you have a priest or a hero having a healing skill, then make sure to include him/her in the team as its skill will help you to keep the attackers, defenders alive even after taking so much damage. As mentioned above, all the heroes belong to one of the five elements; fire, wind, water, light, and dark. Similarly, all the monsters belong to one of these elements. To deal the bonus damage, you can take elemental factor advantage by choosing the right heroes or target. How? Fire-type heroes deal bonus damage to wind element monsters. Wind type heroes deal bonus damage to water element monsters. And, water element heroes deal bonus damage to the fire element monsters. You can check the enemy’s element at the top of their heads. Join a guild and contribute there for guild coins. You can spend these guild coins in the guild shop to purchase rune tickets, skill Beanny tickets, and star Beanny tickets. Completing all the daily quests reward 100 diamonds. So make sure to complete all the daily missions as soon as possible. Additionally, weekly mission milestone rewards 500 diamonds, monthly milestone rewards 1000 diamonds. There are story quests too; you can obtain EXP items, gold, crafting material, diamonds, heroes, and much more. You can earn weapon tickets, hero tickets, rune tickets, coins, Beanny(skill, star) by completing the event missions. Every time you obtain a hero, you get the diamonds as the reward. To claim the reward, go to the hero Illustration menu -> tap the diamond icon at the top-right corner of their hero icon.